The specialists at our Mechanical and Electrical Engineering departments, together with Research and Development, are the people who get the ball rolling when it comes to elumatec’s products. Their goal: To provide customers with the best solution at the best price. For more details on how they manage to do that,what projects are in the pipeline and how they intend to keep increasing customer value, we at 360° interviewed Sascha Czirr (Head of Engineering), Bernd Eggert (Head of Mechanical Engineering), Matthias Ludwig (Head of Electrical Engineering) and Volker Schmidt (Head of Research and Development). MR. CZIRR, AS THE HEAD OF ENGINEERING, YOU’VE BEEN COORDINATING ALL THE WORK PERFORMED AT THE MECHANICAL AND ELECTRICAL ENGINEERING DEPARTMENTS AND AT RESEARCH AND DEVELOPMENT SINCE THE SUMMER OF 2016. WHAT ARE YOUR GOALS? Sascha Czirr: Customers want increasingly shorter product release cycles, and we need to address application needs even faster than before. To this end, we will be optimizing our internal processes and focus even more on teamwork between our individual departments, all while making sure that we maintain the same high quality standards as always. This is the only way we’ll be able to stay one step ahead of the competition in the future while simultaneously keeping an attractive price/performance ratio for our products. HOW HAVE THE NEEDS OF THE INDUSTRY CHANGED? Sascha Czirr: The market wants increasingly automated and efficient machines, which means that the importance of control technology has increased tremendously during the past few years. In fact, a machine’s control system is what determines most of its performance capabilities today. When we look at trends such as Industry 4.0, it’s clear that the importance of control engineering will only continue to grow. Matthias Ludwig: The electrical system is what constitutes a machine’s nervous system. In fact, almost every machine process is controlled with it. This means that both mechanical and electrical engineering aspects are always involved in any customisation, no matter how simple it may appear to be. Of course, this also means that close teamwork is required from the moment an idea comes up to the moment it is ready for production. Normally, as soon as we know which functions a machine needs to be able to perform, we proceed to develop the control solution for it. And to be able to do this properly, we make sure to be perfectly coordinated with the people at Mechanical Engineering. WHILE WE’RE ON THE SUBJECT OF TRENDS: WHAT KIND OF ROLE DOES RESEARCH & DEVELOPMENT PLAY IN ENSURING THAT WE KEEP A COMPETITIVE EDGE IN TERMS OF TECHNOLOGY? Volker Schmidt: When it comes to things like energy efficiency, ergonomics, and lightweight materials, it really pays for itself to look beyond our own noses and learn from other industries so that we can push the envelope in new ways. We tend to take the latest developments in a variety of areas, such as process engineering and materials, and test them with the goal of figuring out what kinds of improvements we can get out of them. Take lightweight materials, for instance: These materials not only enable us to make machines quickly, but also to save energy. In other words, we constantly and proactively explore uncharted waters so that we can be one step ahead of our customers’ needs. COULD YOU GIVE US A COUPLE OF EXAMPLES THAT ILLUSTRATE HOW YOU’VE RAISED THE BAR? Volker Schmidt: Well, the new SBZ 122 series features a bunch of innovations from R&D. An example in the area of ergonomics would be the new safety systems that allow operators to work more closely to their profiles. Other functions that increase efficiency and have been incorporated into standard production include an inclined machine bed, linear motors for aluminium machining and new power solutions. WHERE DOES THE INSPIRATION FOR NEW DEVELOPMENTS AND MODIFICATIONS COME FROM? Bernd Eggert: Well, for starters, we’re in direct contact with our customers through Sales and Application Engineering. A pretty big part of our day-to-day work consists of working on customer orders, that is, on application needs for which we develop solutions. We know our machines inside out. Every single component. Every single screw. And in addition to this, we regularly conduct feasibility studies for requests from our customers. When you put those two together, it means that we know early on how our customers want to use their machines and what they want to achieve by doing so. That provides plenty of inspiration for new developments and enhancements to our existing machines. 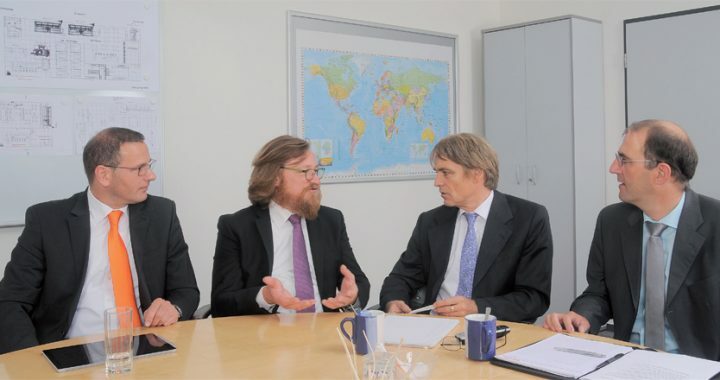 Volker Schmidt: And in addition to that, we also conduct market analyses and visit customers on-site. Among other things, this makes it possible for us to learn more about how our customers work – things such as which profiles are machined with which tools. That information serves as a basis when fleshing out our development plans. WHAT’S YOUR APPROACH WHEN IT COMES TO MEETING OUR CUSTOMERS’ NEEDS AS CLOSELY AS POSSIBLE? Sascha Czirr: We start by putting together our customers’ needs and the market’s needs in a performance specifications document. After that, we check how the idea can be implemented in real life. Basically, everyone tries to figure out what is mechanically possible and what is electrically possible. How far can we take things before we run into an insurmountable barrier? What kinds of new drive systems and materials are out there? This is the stage when new developments from R&D are incorporated. And then we define the machine’s performance limits in regard to speed, applications, tools, axes and investment costs, that is, all the characteristics that will enable us to fulfil our customers’ needs and the market’s needs the best. SO HOW DO YOU IDENTIFY THE LIMITS THAT DEFINE WHAT’S STILL FEASIBLE? Bernd Eggert: When it comes to the mechanical aspect, we primarily use finite element analyses (FEA). A finite element analysis is a virtual method that we can use to simulate the behaviour of components under a variety of conditions on a computer by using the appropriate CAD data. The results we get from this type of analysis provide us with important information on force and stress curves and on things such as the machine’s vibration characteristics. And since we want our machines to always be as light as possible while retaining a highly dynamic performance, this is invaluable, as it allows us to determine, for instance, where we need stiffening or where wall thicknesses can be reduced. Basically, these finite element analyses enable us to optimise our machines without having to make a prototype first, Which saves an enormous amount of time when it comes to the development process. Matthias Ludwig: We use a specially developed simulation program as well. This program lets us display the entire machine virtually in 3D and simulate processes in real-time, which lets us identify where the limits of what is feasible are. For instance, we can determine process times for our customers, that is, how long they will need for a specific machining operation. This all enables our programmers to develop, test and fine-tune the corresponding software at Engineering before the machine is even built, Which reduces our time to market significantly. CUSTOMERS WANT NOT ONLY A CUTTINGEDGE SOLUTION, BUT ALSO ONE THAT MEETS THEIR NEEDS TO A T. HOW DO YOU ACHIEVE THAT? Sascha Czirr: With a modular design and a foresighted development approach that considers all alternatives and options during the engineering process. In fact, this made it possible for us to implement a variety of expansions for the SBZ 122 by only making it necessary to change a few components. This was the key to being able to provide our customers with the best solution at the best price. CAN YOU TELL US A LITTLE ABOUT WHAT YOU’RE WORKING ON RIGHT NOW? Sascha Czirr: Well, it goes without saying that we don’t want to reveal too much yet, but I can tell you one thing: We’re working on various enhancements to existing machines and on a new generation of multi-axis profile machining centres that we want to showcase at FENSTERBAU FRONTALE 2018.